Across the island, skeptics – as skeptics do – are skeptical about its intentions. SIX-SIX.COM says: If you take a step back and reflect on the video, you almost wonder if your emotions have been manipulated. Nevertheless, you have to admire the choice of imagery, if not for its originality, its effectiveness. 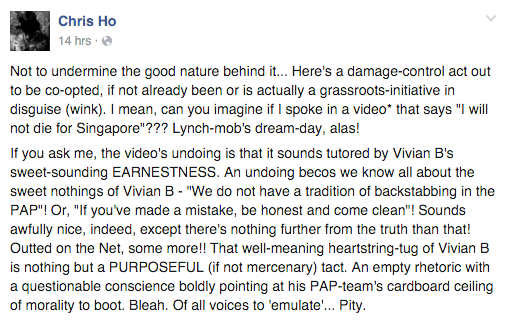 A parody video has been put out by “Kim Huat”, also known as mrbrown, just two days after the original video came out. If the intention is to rally Singaporeans, it is working. Seems we are rallied behind camps of what the bigger picture behind this might be. What do you think, Singapore? – especially since we are the very people this video is trying to reach – Are you questioning its intentions too? d) others / all of the above?